It was always the apostle Paul’s custom to go to the Jewish synagogues when he first arrived in a new place. Some Jews were welcoming of the gospel message he preached, others were not. Paul and Silas found that to be the case when their travels took them to Thessalonica. Though some Jews believed as a result of Paul’s preaching, others rejected the message of the cross, causing a riot so intense that he and Silas were sent away under the cover of darkness. They fled to Berea, some 50 miles away from Thessalonica. When they arrived, as you might expect, they went to the synagogue. Luke records that the Jews in Berea responded differently to Paul’s teaching than did the Jews from Thessalonica. They were “more noble” he wrote, more noble in the sense they eagerly received the message of the gospel, they examined the Scriptures daily, and they examined them with the intent of confirming that what Paul was preaching was true. The result was that many believed. When hearing of Paul’s ministry success in Berea, some of the Jews from Thessalonica came and stirred up trouble. Paul was forced to leave Berea, leaving Silas and Timothy behind to strengthen the new believers in their faith. In today’s world, it seems our accepting something as true is based more on style than it is on substance. Though we might expect this in our politics or in business, unfortunately, we see the same tendency with what is preached from the pulpit. This is unfortunate and leads many in a direction God never intended. That’s why Luke’s recording of Paul’s time in Berea is so instructive and why it should serve as a model for each of us. The Bereans provide a wonderful example of what our approach to the acceptance of anyone’s preaching or teaching should be. Does it line up with Scripture? That’s the only question we need to ask. That is the litmus test of truth. So, let us eagerly examine God’s Word each day. We need them daily. And when we sit under another’s preaching or teaching, let us do as the Bereans did with Paul; confirm what is taught with the Word of God to see if it is so. God’s words are perfect. Let our hearts be eager to receive His truth that we may do His will. A theme is defined as the main thrust of what is being promoted, discussed or described. Its purpose is to help people remember the key messages or takeaways from whatever is being talked about. We find prominent themes used for many things such as movies, lectures and writings. We find themes in business, in advertising and in politics. We even find themes in the church as there is often a primary theme for each year, for individual sermons or a sermon series. Of all the verses in Scripture, I’m not sure there’s a single verse that captures the overall theme of the Bible better than 2 Corinthians 5:21. Personally, it’s my favorite verse. I can still remember when I first grasped the meaning of this verse and the freedom that came with it. That Jesus was my substitute—that He would take the penalty for my sin so I wouldn’t have to just blew me away. Sometimes in my writing, I wonder if I reference 2 Corinthians 5:21 too much. I wonder if because I love this verse so much, I force its use when it doesn’t belong, where perhaps it doesn’t fit the context of what I’m writing about. But the more I think about it, the truth is, this verse belongs everywhere. Its theme can never be repeated enough. That’s because these twenty-four words take us straight to the cross, the center of all that God has done for us. There is no greater expression of God’s love than what we find at the cross. 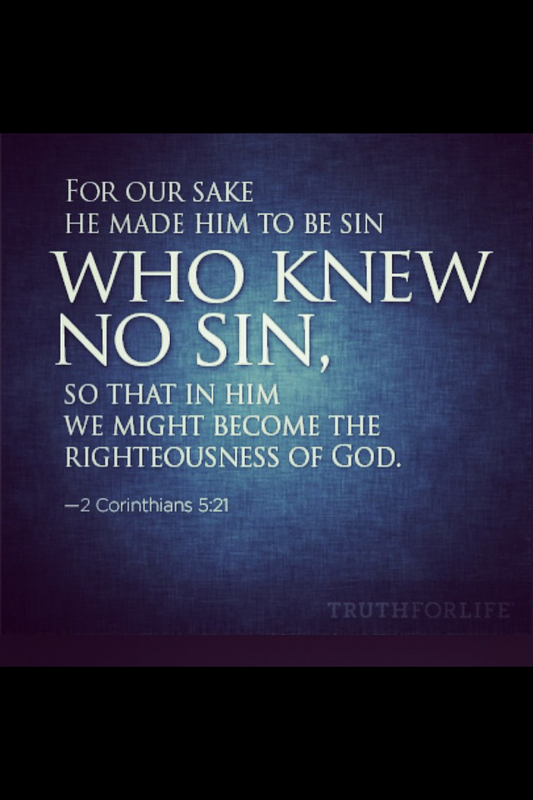 On the cross, Jesus not only took our sin, but also the guilt and shame that goes with it. There’s freedom in that, not freedom to sin, but freedom to live in response to His grace. I don’t think we can even begin to fully grasp the depth of God’s love, and for what He has done for us in Christ. Christ’s atoning work has saved us from an eternal hell our sin deserves. But more than that, He has saved us to a living hope, a hope we are to enjoy today, but also to look forward to in its fullness for all eternity.